Liebherr 2018 Men’s World Cup – Whose dreams will come true in Disneyland? It’s the eve of the Liebherr Men’s World Cup 2018 and the venue could not be more appropriate for 20 players dreaming of lifting the coveted crown. 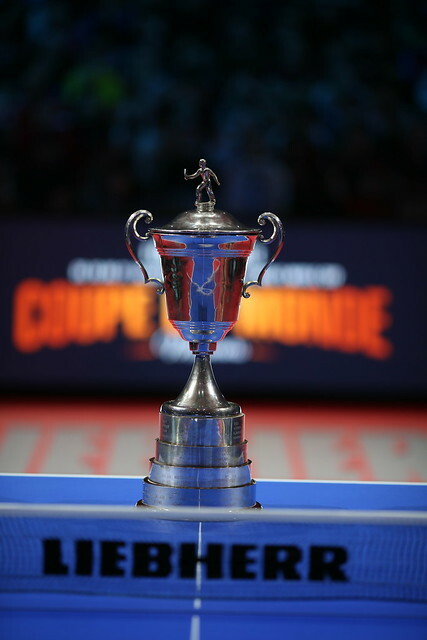 For the very first time, Disneyland Paris is hosting the second most prestigious tournament on the global table tennis circuit for a three-day event that promises to capture the imagination of 4,000 spectators within the Disney Event Arena and tens of millions on TV screens and social media accounts across the world. 2018 Asian Champion FAN Zhendong is in red-hot form and many people’s favourite to win back the title he claimed in 2016 when defeating then team-mate XU Xin in the final. However, the Chinese star was keen to emphasise the high level of competition among this year’s participants. “I am now World Number One and most of the players are doing their research on me,” FAN explained. “For sure I hope that I can put in a good display during this tournament and show my level to all the fans watching. While the eight highest-ranked players are set to enter the knockout rounds automatically on Saturday, tomorrow will see the other 12 contenders vying for the other eight spots in the round of 16. Group A promises to be a closely-matched affair, with 22-year-old Brazilian and Pan American Champion Hugo CALDERANO facing Belarusian legend and three-time World Cup champion Vladimir SAMSONOV and 2016 European champion Emmanuel LEBESSON of France. Group B is also nicely poised with fellow French representative Simon GAUZY, who was defeated my MA Long last year in the Bronze Medal match in Liege, joined by Nigeria’s Quadri ARUNA and Kanak JHA of the United States. Group C features JEONG Sangeun (Kor), who qualified in 4th place in the Asian Cup, Gustavo TSUBOI (Bra), 2nd place in the Pan American Cup, and experienced pro Panagiotis GIONIS (Gre). Bronze medalist at the ITTF-Europe Top 16 Cup, Jonathan GROTH (Den) will be taking on fellow Scandinavian Mattias FALCK (Swe) and Oceania Cup winner, Heming HU (Aus) in Group D.
FAN Zhendong is one of eight men who’ll be swinging into action on Saturday. Joining the World Number One at the weekend will be the defending World Cup champion, Dimitrij OVTCHAROV of Germany, whose compatriot Timo BOLL qualified as Europe Cup winner. Whilst OVTCHAROV will be looking to keep his crown for another year, BOLL enters the tournament with hopes of adding to his 2002 and 2005 successes. Qualifying by virtue of their strong displays in the Asian Cup are LIN Gaoyuan of China, who finished that continental competition in 2nd place, LEE Sangsu of South Korea (3rd), Japanese pair Tomokazu HARIMOTO and Koki NIWA (5th and 6th respectively) and Hong Kong’s WONG Chun Ting (7th). The first group-stage matches commence at 10.00 CEST on Friday, with the day’s final fixtures scheduled at 15.45 CEST. Supporters can follow all the action coming from the two tables by tuning into tv.ittf.com as well as ITTF’s Twitter, Facebook, Instagram and Youtube channels.